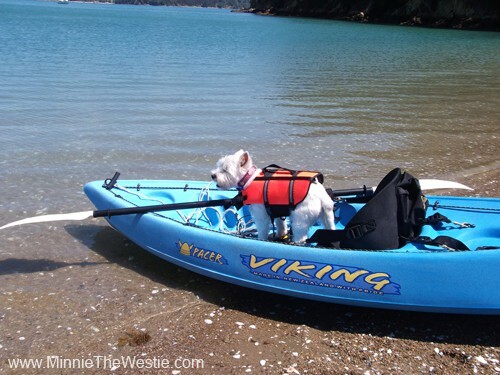 Kayaking dog: Minnie the Westie goes kayaking! 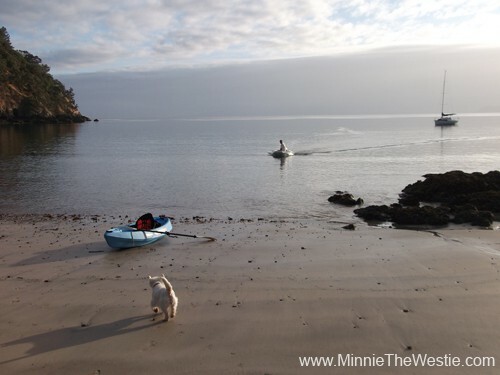 It’s so exciting… Santa brought Mum a kayak for Christmas!!! It was impawtant to Mum that the kayak had enough room for me, so she wanted a sit-on-top one, with plenty of dog space. 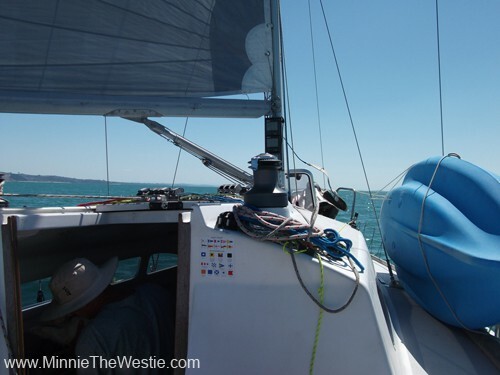 The kayak also has to be small, so that it fits on our small yacht (sailboat). She got a Viking Pacer kayak, which is made here in New Zealand. The Viking Pacer kayak fits on the side deck of our Elliott 7.9m (26ft) yacht. She also made sure we’d be safe out on the water: both her and I already have life jackets. 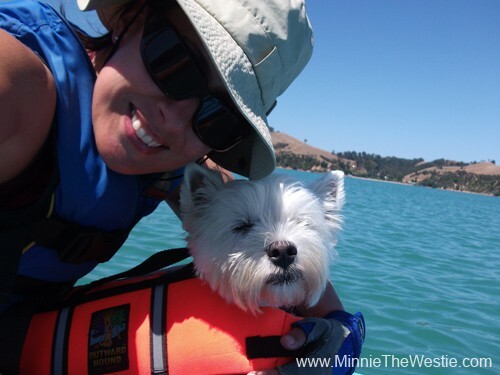 A life jacket is essential for kayaking dogs. If you think that I’m pulling a funny face, you’re right. I hate wearing the life jacket. Orange is so not my colour! Mum says I look cute in it, but I don’t believe her. It’s pawful! Mum and I on our very first kayak outing together. 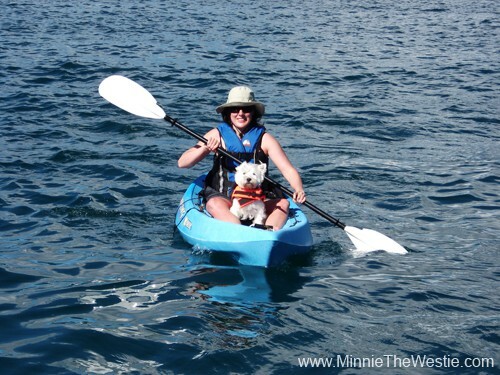 Mum has a silly grin… me, I’m not so sure about this kayaking dog thing yet! 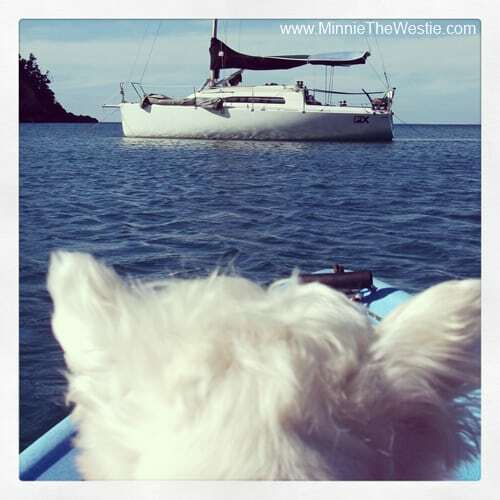 I stay absolutely stock-still like a little furry statue… I don’t want to rock the boat! I should add that Mum did kayak around a lot first, before taking me onto the water, and she only takes me when the water is flat calm. She is always safe and careful. Mum also watched lots of kayaking safety and instructional videos on YouTube at home before the holibobs – her favourite videos are by Paddling TV. One day Dad made us practice our safety manoeuvres. He made Mum capsize the kayak, and (a) got her to practice the “brace” motion to prevent the capsize; and (b) capsize the kayak properly – and then climb back on it. This was trickier, but she did it! The next bit, I wasn’t so pleased with: while Mum was in the water near the kayak (and he was on the yacht), Dad put me into the water, while I was wearing my lifejacket, to check that I could swim in it OK. Since he was the one to put me in the water, it was obvious to me which parent I’d swim to for safety – Mum! I could swim, but it is weird that dog lifejackets have most of their buoyancy on the back, but only neoprene underneath. I hate swimming, and a little more buoyancy would have been nice! Thankfully no photos were taken of me at this point. I am very very pawleased about that! 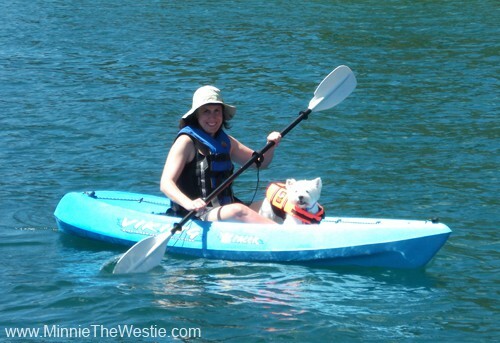 Anyway, here is another photo of me and mum kayaking – I’m looking a little more confident now as a kayaking dog! I am getting more confident as a kayaking dog! Mind you, I do keep nice and still on the kayak. Besides, it’s quite comfy sitting between Mum’s legs! Mum takes me for longer paddles now that I’m getting more confident as a kayaking dog. 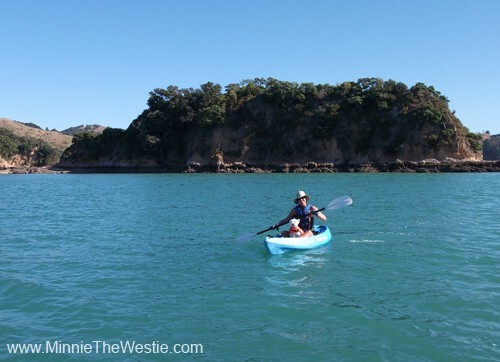 We have the whole bay to ourselves at Ponui Island. Dad joins Mum and I on the beach… he’s arriving in the dinghy. I’m ready to go back to the yacht now! That’s all for now – till next time!